‘Backstage Heroes’ is a series spotlighting the many movers and shakers working behind the arts scenes to make magic happen in the Bay Area. Guiding us is Hiya Swanhuyser, a veteran fan and all-around culture vulture who for nearly a decade helmed calendar duties for the SF Weekly — where her ‘Music Heroes’ series inspired this broader look at the arts — giving her rare personal insight into those toiling in the wings, but rarely in the spotlight. On May 7, 2016, the Washington Post ran an article with the headline “33 protesters arrested in clash with San Francisco deputies.” I noticed it because I’d been at City Hall protesting police brutality the day before. At the demonstrations, I had followed organizers’ instructions -- “Join hands, join hands!” -- to create a giant outdoor human hallway from Hyde Street to the steps on Goodlett Place. The hunger-striking “Frisco Five” used the corridor to approach City Hall, wheeled forward shoulder to shoulder by white-coated volunteer doctors. The intense visual symbolism struck me: sickened citizens, weak yet totally powerful, making their way to the seat of government, framed by this spontaneous phalanx. I wondered if anyone would transmit this image out to the world. I don’t think any did. 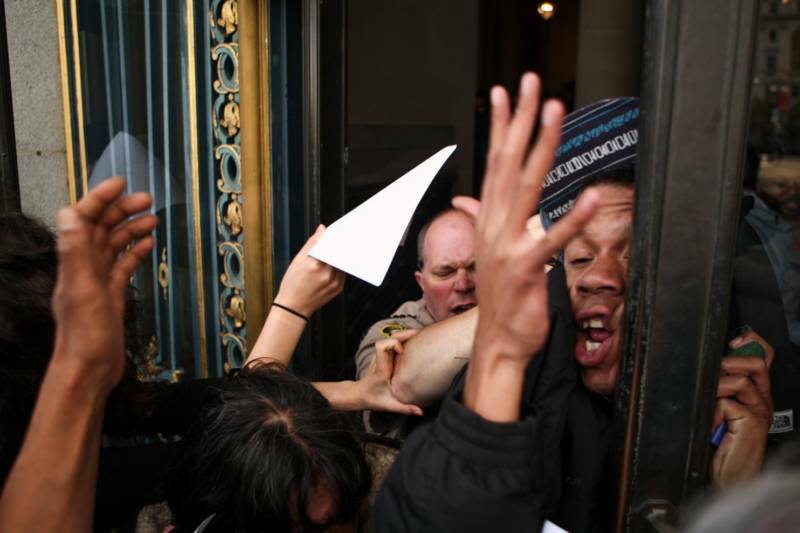 The next day, I ran across the Washington Post article and its sock-in-the-gut image, instead: Surrounded by disembodied hands, a snarling, uniformed white man slams a black man’s face into a metal door frame. A hand emerges from the crowd, grasping the officer’s arm to stop him. Another holds a paper sign. My eyes dropped instinctively to the photo credit: Joel Angel Juárez. I immediately wished this photographer had been standing on the front steps of City Hall when the hunger strikers were making their way through the plaza. Then I realized how close Juárez had been to the dangerous chaos he’d photographed. The photo, picked up by the Associated Press, also appeared in the OC Register, the San Diego Union Tribune, the San Jose Mercury News, Fox News, and more. The protester, James Burch, became, for a short time, the public face of San Francisco’s racist police brutality problem. Joel Angel Juárez is 20 years old, tall, and quick to smile. He’s a third-year journalism major at San Francisco State University, with a photojournalism emphasis and an international relations minor. When we sit down at a Mediterranean café near the Main Library, he’s just finished covering the Frisco Five’s visit to a Police Commission meeting. 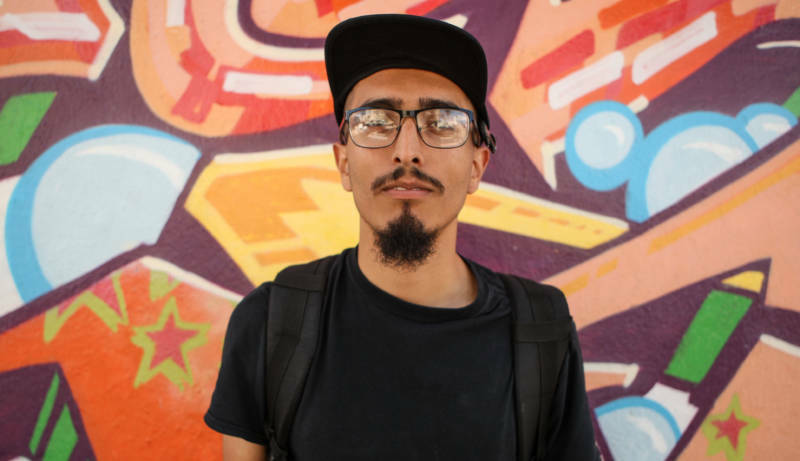 We talk about how he got started shooting (“On film!” he says, himself a little incredulous) and about how a street-art fan on a bike became an independent photojournalist committed to learning how to tell the story of police brutality. What he can find, often, is the perfect shot -- and the guts to get the right angle. “It’s funny, because some people feel like 'Okay, I have a camera in my hand, I’m invisible, I won’t get hurt,'” he laughs. “But that’s BS. You’re always on the line, you’re out there.” This is a visceral reality: Later in the evening of May 6, Juárez and three other journalists tumbled down a flight of stairs inside City Hall after a scuffle with a Sheriff’s deputy. Some of the journalists allege they were shoved; two of the journalists required medical attention. “I hit the ground, my camera hit the ground,” Juárez tells me. A Sheriff’s Department investigation has begun, and there’s a possible civil damages suit. Maybe I’ll never get my photo of the Frisco Five taxiing up to City Hall. Then again, maybe that pretty picture wasn’t the important one, wouldn’t have gotten at the real story about San Francisco right now. On May 20, San Francisco Police Chief Greg Suhr complied with Mayor Edwin Lee’s request for his resignation, hours after an SFPD officer shot and killed an unarmed 27-year-old black woman. A Reuters article from that day points out that lethal police brutality against communities of color “has been the focus of nationwide protests since mid-2014.” And I can’t help but think on how committed journalists, photo and otherwise, have played a part in holding people accountable on these issues, have helped figure out what happened in these situations. Especially those who, when they find themselves at the bottom of a flight of stairs, get right back up and keep going.